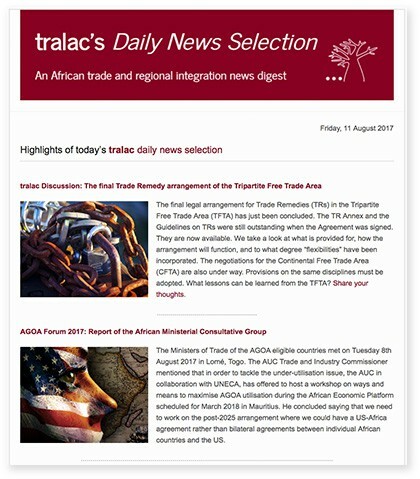 tralac is a trade-related capacity-building organisation, developing and enhancing trade law and policy capacity in east and southern Africa by adopting an inter-disciplinary approach. tralac works with governments and non-state actors; these include private sector and civil society organizations. It collaborates with many regional and international organisations; such institutional partnerships expand the reach and impact of tralac’s work. tralac undertakes capacity building programmes clustered at three levels: Research, Training and Policy Dialogue. Its research activities involve applied trade law and policy analysis aimed at addressing the most pressing trade matters. tralac monitors trade negotiations, assists with interpretation of agreements, makes contributions to debates and discussions on trade developments. Training activities include short courses (for example on trade policy analysis), while postgraduate programmes include an accredited Master’s programme in trade law and policy. Policy dialogue is promoted through active debate on trade law and policy measures in the region, through the tralac website, social media, the electronic newsletter, as well as through workshops and the annual conference which has become an important forum for discussing the region’s trade agenda.